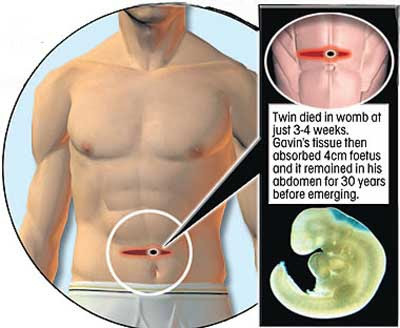 A man reeled in agony as his stomach ruptured — and the embryonic remains of his twin spilled out. The lumpy mass forced its way out after lying inside Gavin Hyatt’s abdomen since he was born 30 years ago. In a scene echoing the horror movie Alien, Gavin staggered into his GP’s surgery bleeding from his belly button. Medics said the growth was a parasitic twin — Gavin’s identical brother who died in the womb early in their mum’s pregnancy. 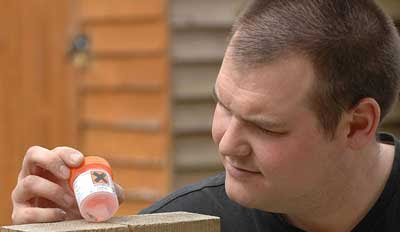 The 4cm foetus then became embedded in Gavin’s tissue and stayed in his stomach for the next 30 years. There are just a handful of cases worldwide — with the majority reported in Asia.